Click on User menu on top right corner, click on Settings on the drop down menu. 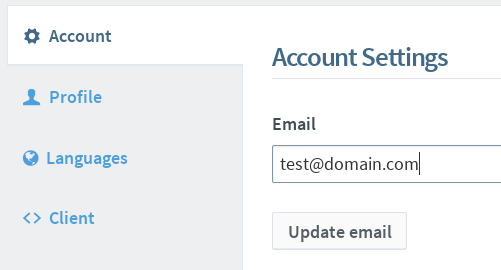 Alternatively, you can click on the Settings tab on your dashboard page. Enter the new email address in input field and click Update email. A confirmation email will be sent to the new email address. Click on the link or the URL to confirm email address change. Fill in the Old Password and New Password fields. Click Update password to change your password. Use this to merge additional Zanata accounts you may have created when signing up with a connected account. Select and login into any connected account that you wish to merge with current logged in account. Click Merge account button merge from the selected connected account into current logged in account. To update your name, fill in updated name in input field and click Update profile. This page shows all the language teams you have joined in Zanata. Click on Join a language team. API key is a unique identifier used for authentication between client and Zanata server. Zanata CLI uses it for authorization. To generate an API Key, click on Generate new API Key button. The updated settings for your Zanata client are available in the text area below. For more information on setting up Zanata client, see Zanata Client configuration.